Colleges and universities have dozens, maybe hundreds, of scholarships to give away! Do you know how to search a college or university website for scholarships? Digging up scholarships from college websites has become second nature for us. But it occurred to me that many students might not know how to find those college scholarship lists buried as they can be on deep college pages. I’m going to share some quick tips that should help you find the scholarship resources you need on any college website, including some you could be missing. Institutional scholarships—target general students and are based on academic merit and/or financial need. Endowed scholarships are likely department specific, and target a much smaller population of students typically studying in a particular subject or pursuing a certain degree. **An endowed scholarship is one funded by private sources, often outside alumnae or corporations, usually with fond ties to the institution or department. You’ll also see many awards that have been established in memory of a student or faculty member, also endowed scholarships. Start at ABC College’s homepage, not the bookstore page or the football team’s page, but the main page, probably something like, www.SomeCollege.edu. There are some pretty standard links on this page (obviously if any links say “scholarships” that should be a no-brainer, but that situation is rare); look for “Admissions,” “financial aid,” or “financial aid and tuition.” You might be given more general categories, like “prospective students” or “current students.” Some colleges try to make it more intuitive, with links like “paying for school.” Also, many sites feature a “Quick Links” drop down menu. 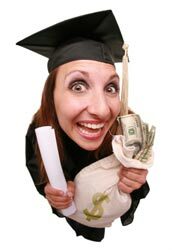 Here you are likely to find a standard “financial aid” link. From the Financial Aid main page, you will likely have a choice of links including “how to apply,” “forms and applications,” and “types of financial aid.” Usually the “types of financial aid” link is the lead-in to information on scholarships, as well as loans and work-study programs. Follow the “scholarships” link. Chances are good you’ll end up on a page that tells you a bit about the institutional scholarships available, those merit and need-based general scholarships, plus information on eligibility and applying. Often there are further links for “outside scholarships” and “endowed scholarships.” Use these to access more targeted awards. There are a couple of different ways to find the department-specific scholarships on a college or university website. Department specific scholarships may be as easy to find as the “endowed scholarships” link or they may be buried in deeper department pages with little direction on how to access them directly. I see the words ‘academic departments’ on the main menu, so I’m headed in the right direction. 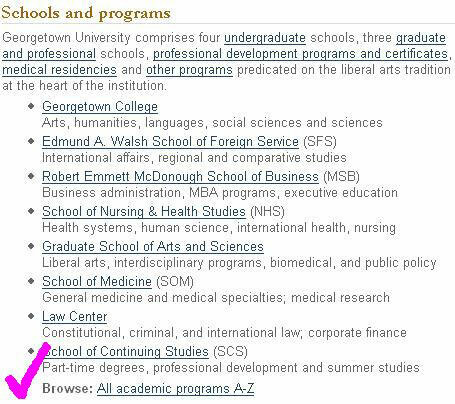 From Georgetown University’s Academic Programs page I noticed a link stating, "All academic programs A-Z". Perfect! Anthropology was selected from the list and I arrived at the Department of Sociology and Anthropology. There I had to choose from even more targeted links, and I went with “For Anthropology Students,”, it seemed logical. Finally, that led me to the Anthropology Student Resource page and a long list of departmental scholarships and fellowship programs. See? It can get tricky and I occasionally choose incorrectly using websites of different universities. **The trick to finding departmental or endowed scholarships: be persistent. What do I do when I’m at a dead end? Back out and try again. First search result: the GU Anthro department page (same page I described above where I clicked on the Resources link). **Tip: Large universities house related departments inside colleges. The “College of Arts and Humanities,” for instance, will likely have a variety of departments like English and Sociology, so you might have to dig through a few academic layers to really get to the place where you want to be. If you get confused: Google the department name and university, simple as that. my name is yesihak semu am from Ethiopia. i got my LLB. degree in law .now am working for federal high as an assistant judge.now am looking for post gratuate programme to learn one of the following departments or areas.1,public administration.2,human right.3,conflict resolution.4, good governance.5poltical science. you are only bassed on america. there may be other student waiting for your loans.